Sergei Leiferkus has appeared with major opera companies and symphony orchestras in the West since the early 1980s, when he made his début with the Berlin Philharmonic Orchestra under Kurt Masur. Since then he has appeared frequently at the Royal Opera House, Covent Garden; the Vienna State Opera; the Opera Bastille, Paris; La Scala, Milan; San Francisco Opera; the Metropolitan Opera, New York, Netherlands Opera, Amsterdam; Teatro Colon, Buenos Aires and at the Edinburgh, Bregenz, Glyndebourne and Salzburg Easter Festivals. He has also appeared with orchestras such as the London Symphony, Boston Symphony, New York Philharmonic and Philadelphia Orchestra under major conductors including Claudio Abbado, Valery Gergiev, James Levine, Bernard Haitink, Zubin Mehta, Riccardo Muti, Seiji Ozawa and Sir Georg Solti. His operatic roles include Eugene Onegin, Mazeppa, Telramund, Klingsor, Pizarro, Amonasro, Don Carlo in La forza del destino, Scarpia, Don Giovanni, Mephistopheles in La damnation de Faust, Escamillo, Rangoni, Prince Igor, Iago, Nabucco, Macbeth, Simon Boccanegra and many others. 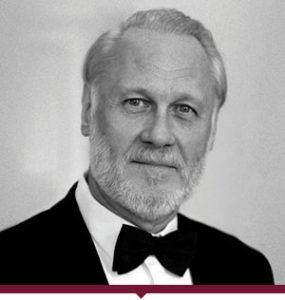 Sergei Leiferkus has recorded for BMG/Conifer (with whom he has recorded the complete songs of Musorgsky, the first volume of which was nominated for a Grammy award, the second volume of which won a 1997 Cannes Classical award and the same year three of the CDs were awarded a Diapason d’Or), Decca, Philips, DG, Chandos, Sony and Teldec, and videos of his operatic performances are available on Kultur, RM Arts, National Video Corporation and others. Sergei Leiferkus has given memorable song recitals at various international venues, including the Royal Opera House, Covent Garden, the Wigmore Hall, London, the Teatro alla Scala, Milan, the Lincoln Center, the Frick Collection, New York, and in many other cities across the United States as well as at the Tanglewood Festival, the Philharmonie, Cologne and the Konzerthaus in Vienna. He has also given masterclasses in Berlin, Toronto and Boston, and appears regularly in this capacity at the Britten-Pears School, Aldeburgh. Future engagements include Rachmaninoff Aleko and Francesca da Rimini with the Russian National Orchestra, title role in Eugene Onegin and Peer Gynt in concert performances with the National Symphony Orchestra in Washington DC conducted by Leonard Slatkin, A Florentine Tragedy with the Orquestra Sinfonica do Estado de Sao Paulo, Shostakovich 13 and Shostakovich 14 with the London Symphony Orchestra (conducted by Daniel Harding), Telramund in Lohengrin at the Deutsche Oper Berlin, Shostakovich 13 with the Dresden Staatskapelle conducted by Kurt Masur, His Serene Highness in Cherevichki at the Royal Opera House, Covent Garden, Ebn Hakir in Iolanta with the London Philharmonic conducted by Vladimir Jurowski and concerts with the Montreal Symphony conducted by Kent Nagano to celebrate the orchestra’s 75th Anniversary.